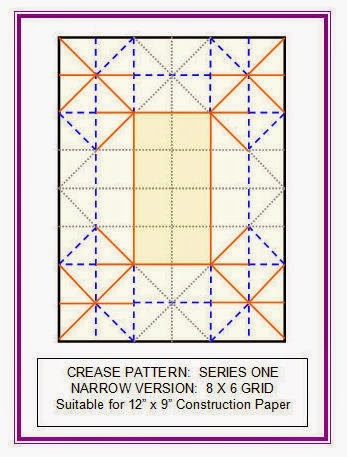 This is the first in a series of boxes that have been designed as sturdy stand alone containers, insert receptacles for decorative origami wraps, or bases for pretty lids made from a different pattern. As of today, there are ten different boxes in the Basic Boxes Series. Each has a different feature. I will post details of each as I complete the diagramming and instructions. The first in the series was designed to have very strong ends. 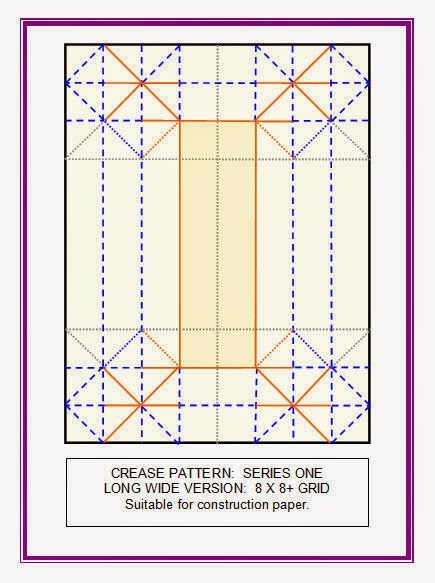 This makes it a good insert for the Crossover Box that I posted about on this blog some time ago. That decorative wrap requires some downward force on the top during the final part of its construction. The original box tended to collapse which resulted in a couple of us origami enthusiasts coming up with some modifications to accommodate this. This is an additional one. I will come back to this box in later months as I have designed other variations. All variations of the box can be squashed flat. This means that it can be sent through the mail, put in a pocket or transported in a purse or a binder for later reconstruction. 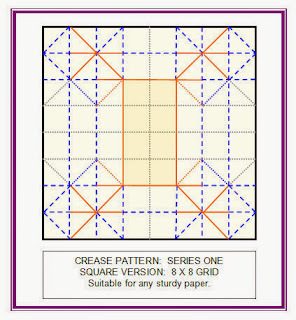 The simplest version is made from construction paper (12" x 9" --> 8 x 6 grid) or other material with a 4:3 ratio. This version has a single layer floor. If you use construction paper I would recommend using high end heavy duty fade resistant alternatives. These fold much better than the cheaper versions. 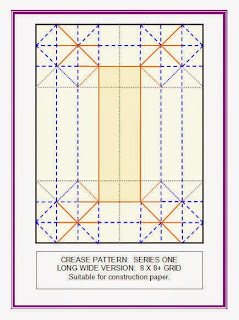 The more complex versions of the pattern, made from square paper or generic oblongs, have a double layer floor. 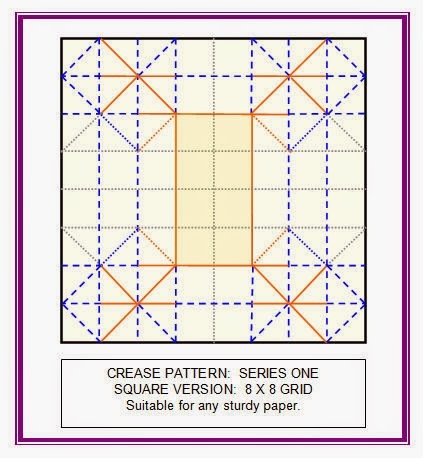 Here are the Crease Patterns for the three versions. 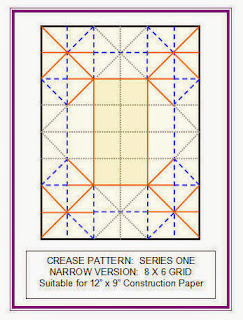 I recommend making the simple 8 x 6 grid one first as the others require that you pull out the second layer of floor from the side walls, and then lock the model by folding over the end walls underneath this layer. Full instructions, with copious diagrams and photos, are available for purchase from my ETSY shop. This can be accessed from the Side Bar of this Blog.